An intensive concoction to soothe lips and replenish moisture. 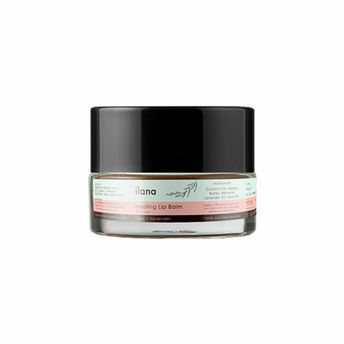 Ilana Organics healing lip balm with rose and lavender essential oils has a rich and nourishing formula that relieves chapped or dry lips. The 100% natural and organic formula envelops lips in emollient ingredients to help hydrate and improve the texture of lips so they're healthier-looking, soothed, and softer. About the Brand: ILANA Organics offers multipurpose skincare products from 100% natural and sustainably sourced ingredients. The brand sources all it's high performance ingredients from ecocert and trade safe certified farms around the country. Being all natural, toxin, paraben and sulphate free, the brand is what one might call organic goals for the urban city dweller.